The old folks on our small island are sometimes upset because of the changes that are taken place. For me I embrace the kind op progress that has been taken place in the field of communication. Some 30 years ago, when we moved from Holland and made Saba our home, I had to stay in contact with family and friends by writing letters and sending them by airmail. A phone call was too expensive and there was a lot of echo in the call. It took about 2 weeks before my letter reached and another 2 weeks before I would get a response. Nowadays, with one push on a button on my computer or I-pad, I can talk with my grandkids instantly and even see them on the screen. This is really progress for me and I love it. I had two thermofax screens made. One of a letter my mom ( who died 35 years ago) wrote me when I was on vacation as a teenager. This text I printed with puff paste and heated it. 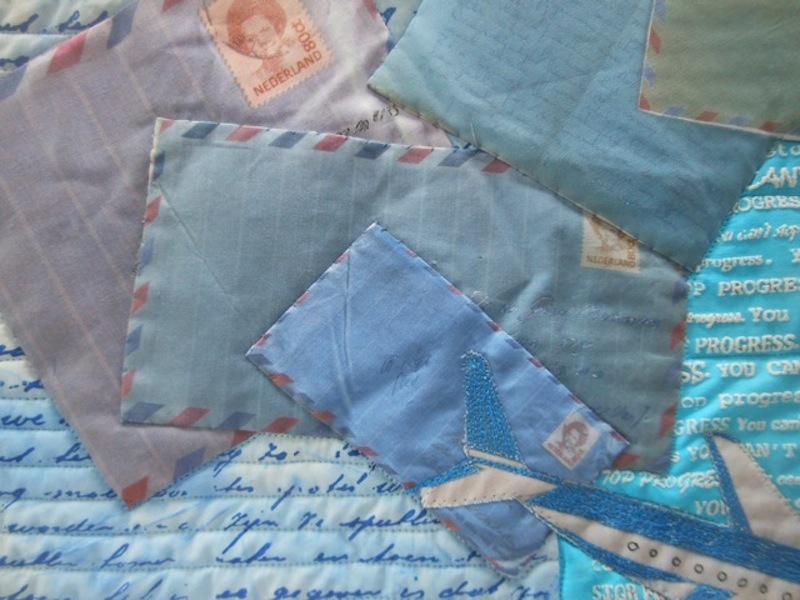 Then I made photo’s of old envelopes and letters, sent to us when we just started to live on Saba, and printed them on fabric. 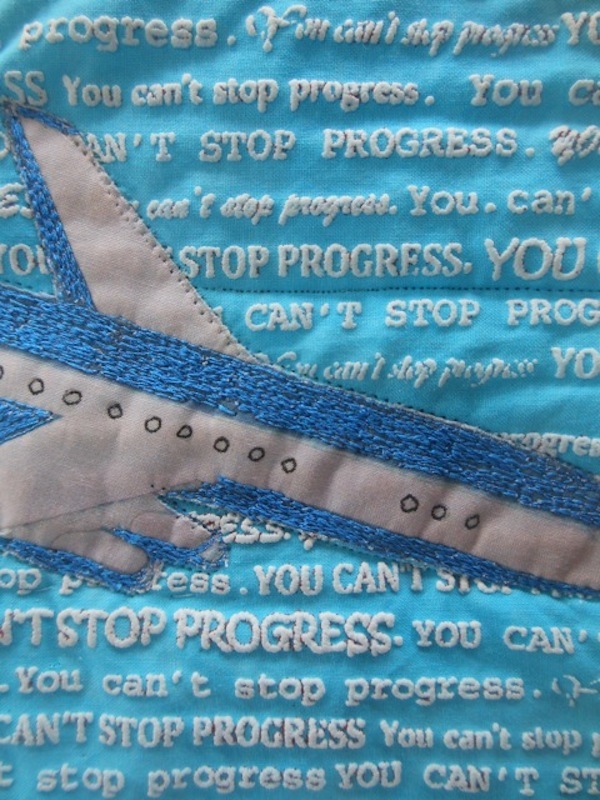 The airplane is a photo from an old airmail paper cover, printed on fabric and threadsketched on the machine. 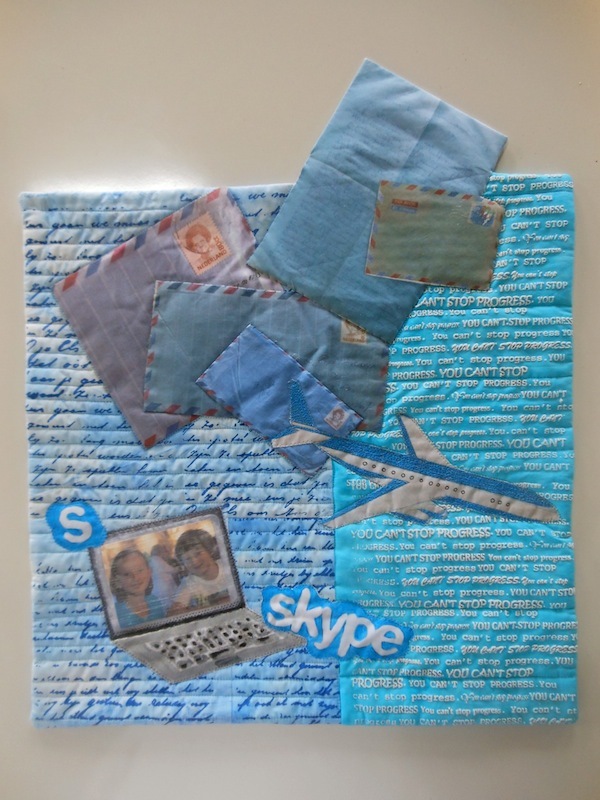 I copied the Skype-logo and painted it on fabric and appliquéd it on the background, as well as a computer. I added a printed picture of my grandchildren to the computer. The picture is covered with organza to get the impression of the glass screen. 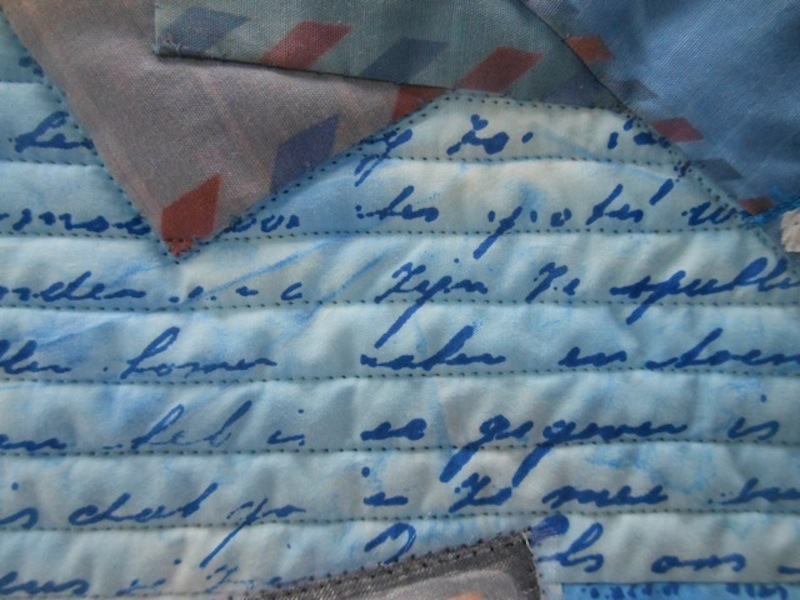 The letter of my mom is machine quilted between the lines as to have the illusion of lined paper. It was hard to quilt over the puff paste so I did just underline some off the capital text.